* Moving from Conversation to Action? I chose the "Manifestos" topic for my contribution, because it seemed like a big idea, and also because I knew it would come first in the book so my contribution would be earlier in the mix of over 200 others. That plan clearly worked, because my article titled "The Control Myth: An Inside Look At The Worst Advice In Marketing Today" is on page 5 (I can’t help it, I’m a marketer even in a room full of marketers!). Though I was not part of the first edition of Age of Conversation, that was also a great compilation, and this time around the project is twice the size and has contributions from many authors, bloggers and others that you will definitely recognize. No matter if you are a pro and already understand much of this world, or someone trying to figure it out, I guarantee you will find lots to learn from in this book. And you’ll also help a worthy cause as all the proceeds from the book go to benefit Variety, the Children’s Charity. So what are you waiting for? 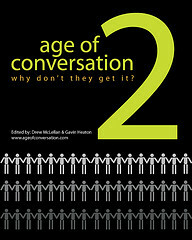 Visit http://stores.lulu.com/ageofconversation and get your copy of Age of Conversation 2 in digital or print format. And flip to page 5 to see my counterintuitive contribution about control and branding. I’ll give you a hint … the future is NOT about giving up control. That’s the control myth and in my piece I share the perception shift required to get past it.